You’ve been known to prattle on about ice and the various merits of its size, shape and quality. You can wax poetic about pellet ice, clear 1 x 1 cubes, crushed, avoiding bubbles, hand chipped ice, etc. and will, when given the chance. Now, at 4:00 PM on July 26th during Tales of the Cocktail, you can channel your inner polar bear and put your money where your mouth is, all by taking part in the Macallan Ice Ball Plunge — a refreshing way to raise some much needed funds for The Museum of the American Cocktail (MOTAC – www.museumoftheamericancocktail.org). Why jump into a cold pool in the name of scotch and a museum? Well, besides the fact that it’s going to be warm in New Orleans and a quick dip will sure feel nice, you’ll be doing some good for the cocktail community and culinary history aficionados everywhere. MOTAC, which is currently housed within the Southern Food and Beverage Museum (www.southernfood.org) in New Orleans’ Riverwalk complex, is about to move to a more permanent home and needs your help to do so. I was delighted when Francine invited me to do an ongoing series of bartender portraits for INSIDE F&B. We all have our favorite bartenders – and most of the time they do all the listening. Wouldn’t it be nice to listen to them for a change? So here begins a new series, Portraits from the Bar, featuring a special bartender or cocktailian each week. Let’s begin with one of Chicago’s finest mixologists, Carlos Enrique Cuarta. 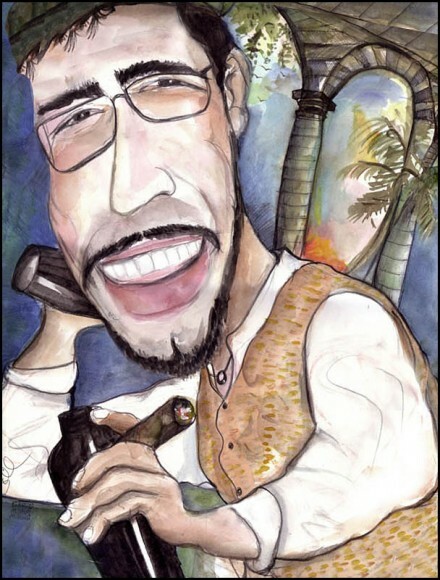 Originally from Venezuela, Carlos is an active member of the USBG Illinois Chapter and a passionate supporter of many of the industry’s charitable organizations, including The Museum of the American Cocktail. In 2010, Carlos was the recipient of the Diageo Celebrate the Future Scholarship Fund, which enabled him to continue his spirits education at the prestigious Beverage Alcohol Resource in New York City. “As a child I loved to negotiate- I might trade three balls in exchange for a baseball bat, a soccer ball for a bicycle seat, or homework in exchange for biscuits and sweets… All was negotiable. So one day my Uncle Ramon took me to the amusement park. He always bought me plenty of tickets for the rides but as quickly as they came into my hand, they were gone. Finally it was lunch time. My uncle drank a few beers and I had a Malta. I was only seven years old, but I understood currency and math. Uncle Ramon, I asked, ‘What is the price of your beer? I propose a deal, I said. For every beer you drink while I drink a Malta, you give me 75 cents—the difference in value between the two. He looked at me, smiled [and said] Okay, Carlitos. Uncle, you owe me $3.50. Ah, but you have drunk four beers so you owe me 75 cents for the first two, and a Bolivar for the other two. Whether I drink or not, you must pay the difference so we are equal in spending- and this way we can put all the money towards our next visit to the amusement park! My uncle looked at me and laughed, You are a clever rascal, Carlitos! Pre-chill your cocktail glass before preparation, adding ice and a little water. Set aside. In mixing glass, add two sage leaves, honey syrup, lemon juice, Cynar Liqueur, and muddle. Add Diplomatico Añejo, spiced rum, and egg white. Add ice to tin, shake well. Discard the ice and water out of the coupe. Then, double-strain using the strainer on the shaker while pouring contents through a sieve placed over the coupe. Garnish with two sage leaves. Sip and Salud! USBG chapters holding local cocktail competitions using DonQ Rum http://www.donq.com/rum/ . Regional winners, who are announced on 4/16, will each receive a DonQ Rum kit, a trip for 1 to the Manhattan Cocktail Classic www.manhattancocktailclassic.com including roundtrip coach airfare and hotel, and the right to compete at the Semi-Finals held at the Manhattan Cocktail Classic on 4/17.